Rep. Buck McKeon (R., Calif.) blasted President Barack Obama on Monday for not acknowledging the victories U.S. forces have achieved in Afghanistan and explaining America’s moral responsibility in the war. McKeon, the chairman of the House Armed Services Committee who will retire at the end of this year, said he was delivering the speech President Obama "won’t give" at the National Press Club. He criticized the president for not speaking out about Afghanistan more and instead touting the full withdrawal of U.S. troops from Iraq. He noted findings from a Washington Post-ABC News poll in December that two-thirds of Americans now think the Afghanistan war has not been worth fighting. "Does the White House really think they can pretend a war isn’t happening?" he asked. "Counter insurgencies have two fronts—that one out there and the one right here," he added. "The troops have held their line out there. The president has not held the line here." McKeon pointed to vast improvements in the health and education of the Afghan people since U.S. involvement, including millions more children enrolled in school. Women especially fear another takeover by the Taliban that would threaten their educational opportunities and safety, he said. "Illiteracy, isolation, and poverty are the chains the Taliban uses to bond the Afghan people into submission, but Afghanistan is starting to break those chains," he said. The Afghan National Security Forces (ANSF) have also nearly doubled in size since 2009 and now conduct more than 90 percent of conventional and special operations in the country after training by U.S. forces, he said. "Why on earth will [Obama] not take credit for his own strategy?" he said. Taliban insurgents remain a threat and have consolidated gains in rural areas where they traditionally held support, according to a Defense Department report released last November. Terrorist groups such as the Haqqani Network can also still launch attacks from safe havens in neighboring Pakistan. McKeon said it is vital that the U.S. military leaves a residual force after the end of this year, when the current security agreement with Afghanistan expires. Those remaining troops would help provide the ANSF with administrative and air support, logistics, and intelligence. "Without our support—and that support includes presence and money—the Afghan Security Forces can’t execute," he said. Afghan President Hamid Karzai has confounded U.S. officials by refusing to sign a Bilateral Security Agreement (BSA) that would guarantee a post-2014 U.S. presence in Afghanistan. Many are now pinning their hopes on candidates in April’s presidential elections who all say they support the BSA. President Obama is reportedly considering multiple options for a post-2014 U.S. presence in Afghanistan that range from 10,000 troops conducting counterterrorism and training operations to a complete withdrawal. While military commanders recommended the 10,000-troop level, some White House officials favor leaving a reduced force of 3,000 troops that would be restricted to Kabul and Bagram Airfield, according to a Washington Post report. However, the smaller force would likely be unable to monitor aid projects and continue to provide security for CIA operations that provide intelligence for the drone attack program in Pakistan. A U.S. official told the Post that the Pentagon, State Department, and intelligence community all back the 10,000 troop option. "The only people interested in the low numbers are in the White House," the official said. 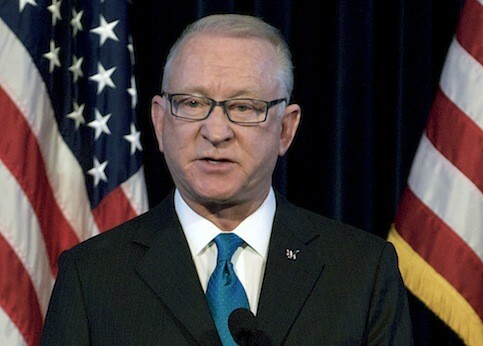 McKeon criticized the White House’s overall handling of the war, including the simultaneous announcement of a surge of troops and their withdrawal date and "White House staffers telling four-star generals their business." Stories like those of U.S. Marine Cpl. Dakota Meyer, a Medal of Honor recipient who has advocated for U.S. visas for Afghan translators helping troops, remain untold, he said. "It’s a national disgrace that a traitor like Edward Snowden is a household name" and soldiers like Meyer are not, he said. The United States ultimately runs the risk of repeating the same mistake it made 25 years ago when it withdrew support for U.S.-backed Afghan forces, leaving the Taliban and eventually al Qaeda to take over and plot the Sept. 11, 2001, attacks, he said. "The Taliban are brutal. They are a cruel, barbaric horde and their kind has no place in the 21st century," he said. "We abandoned the Afghans to the Taliban once before, and both the United States and the people of Afghanistan paid the price." This entry was posted in National Security and tagged Afghanistan, Barack Obama, Buck McKeon, Obama Administration, White House. Bookmark the permalink.